Jim Plunkett played collegiately for Stanford University, where he won the Heisman Trophy, and professionally for the Oakland Raiders were he won Super Bowl XV (MVP and Super Bowl XVIII. 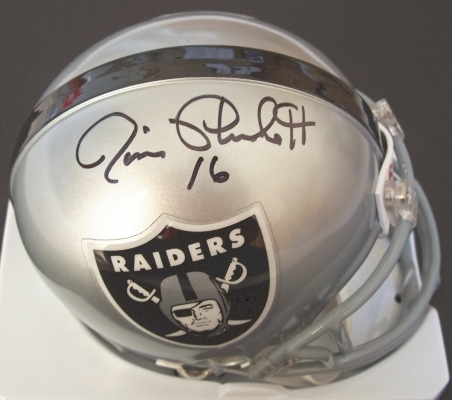 Jim Plunkett has personally hand signed this Oakland Raiders Riddell Mini Helmet with a black sharpie pen on 6/4/06. This item comes with an authenticity hologram on the mini helmet, and a Certificate of Authenticity from The REAL DEAL Memorabilia, get THE REAL DEAL.